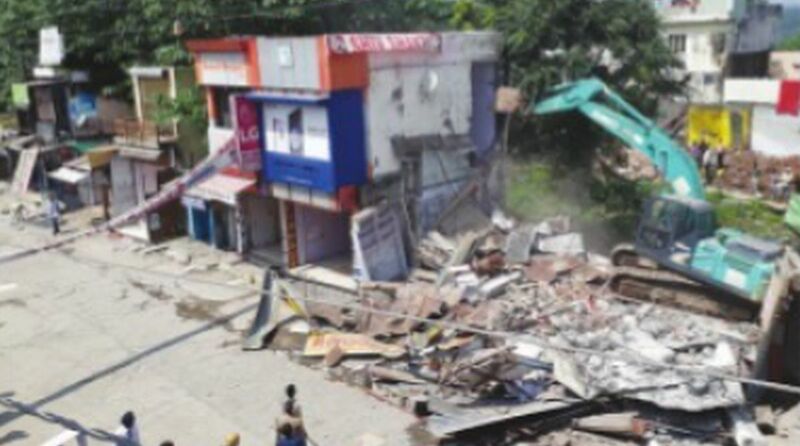 Many prominent political leaders, who had come in open support of encroachers, were absent from Premnagar here on Friday when a team of the district administration carried out a major demolition drive in the market. The district administration is conducting its anti-encroachment drive under the instructions of the Uttarakhand High Court. Over two months back all the legislators of Dehradun, both from BJP and Congress, expressed solidarity with encroachers and forcefully stopped the drive at Prem Nagar. Many even claimed that they will die to protect the public from the anti-encroachment drive. But, recently the Uttarakhand High Court issued fresh instructions asking the administration to take action against those creating hurdles in implementation of court direction. The court order forced leaders like Dinesh Aggarwal (Congress), Ganesh Joshi, Khajan Dass, Umesh Sharma Kau, Harbans Kapoor and Sahdev Pundir (all from BJP) to maintain silence. 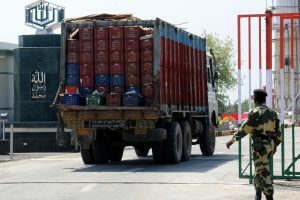 The congested Premnagar market was a major bottleneck for traffic on the Dehradun-Ponta Sahib national highway. Everyday traffic jams used to affect the public. By removing illegal structures from the highway, the local administration has solved a longstanding problem hampering smooth flow of traffic. Under the anti-encroachment drive the exercise of demolition, identification of illegal encroachments and illegal constructions on footpaths, lanes, roads and other places and sealing of illegal encroachments in Dehradun city by Mussoorie-Dehradun Development Authority, Municipal Corporation (Dehradun) and district administration has been going on. Heavy police force and a small number of army men were deployed and the market place was turned into zero-zone by diverting the traffic. The police force and district administration team reached the Premnagar market by 8 a.m. The police had to use mild force as one miscreant hurled stone on the forces. After the initial period things turned normal and the anti-encroachment team razed over 150 illegal structures. The Premnagar market flourished in the 1920s when the construction work of the Indian Military Academy and later the Forest Research Institute started from the locality. In the 40s Premnagar had a camp for prisoners of war and during the Partition period a refugee camp was established here. It was named after Rai Bahadur Prem Nath, a prominent citizen of the city, who owned a cinema hall in Dehradun. Till 13 September, a total of 4933 illegal encroachments have been demolished, 8608 illegal encroachments have been identified and 139 buildings have been sealed under the drive which started three months back in Dehradun.